The Middle Ages were no joke. Folks were seriously hard-core. For example, what did you wear to work today? I’m guessing it wasn’t a full-on set of battle regalia armor that weighed about as much as a cinder block around your neck. It’s highly unlikely that you would need to, since your chances of getting into a good, ol’-fashioned joust of honor are relatively slim. However, if you ride a motorcycle, you shouldn’t put away that armor just yet. The new Speed & Strength Full Battle Rattle collection offers the new suit of armor for knights of the 21st century. Kicking off with the Speed and Strength Full Battle Rattle Boots, you can protect your metatarsus with this combination leather/synthetic upper option that incorporates molded internal toe and ankle reinforcements, and engineered external PU protectors. Upgraded comfort and tactical feel is attained with the Lock N’ Load aluminum buckle, with an adjustable strap and anti-slip rubber outsole. 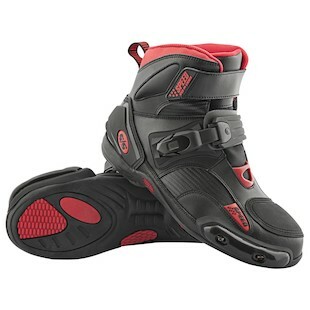 Additionally, the Full Battle Rattle boots make use of a replaceable toe slider that can be purchased separately. Constructed of 1.2-1.4mm premium cowhide and lined with removable Vault CE-approved armor at the shoulders, elbows, and spine, the Speed and Strength Full Battle Rattle Jacket is a solidly defensed jacket for summer riding. 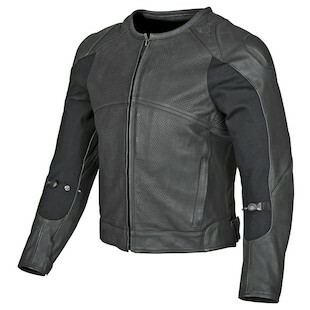 With pattern perforated leather panels over the chest and low-restriction collar, there is little resistance for air to flow through, thus keeping you cooler on hot days. At the same time, however, additional defenses such as external shoulder protectors guard against unfortunate meetings with the pavement. For a short cuff, cowhide/goat-skin combination, the Speed and Strength Full Battle Rattle Gloves offers three-season functionality focused on comfort and protection. A vented, carbon fiber knuckle provides protection and air-flow to the back of the hand while raised protectors line the outer fingers and thumb. Additional protection can be seen in the palm with a beefy, foam-backed landing-zone protector for the lower wrist. 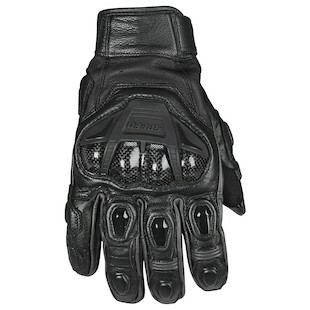 By utilizing a goat-skin palm and external finger stitching for tactile feel and comfort, this glove offers a plethora of features for the price. Paying homage to the best of our best, the Speed and Strength SS1400 Full Battle Rattle Helmet offers an advanced fiberglass composite shell for lightweight, heavy-duty protection on the street. With a Cool-Core removable, washable, and moisture-wicking liner and Air Strike direct course ventilation system in hand, comfort does not have to be forgone in a trade off for protection and style. 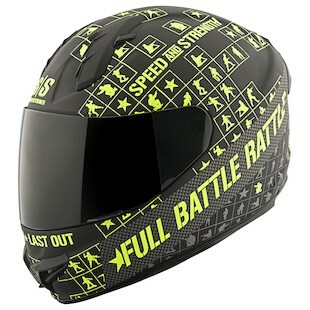 Additionally you can utilize features such as a removable chin curtain, a breath guard, and the Speed Strap quick-release chin strap mechanism in this DOT and Snell M2010-approved helmet. If you are going to do something, it is best to do it fully. Half Battle Rattle? Nope. That is lame. It is all about the Full Battle Rattle from Speed and Strength.